Elephant ears, or Colocasia esculenta, demand attention in any garden. Their large, wide leaves grow fast and very large--they can grow as high as 7 feet tall. It's no wonder gardeners want this showstopper to appear in their gardens year after year. Unless you live in a tropical climate or want to plant them as an annual, however, these plants need to be dug up and stored for the winter. You will want to dig up elephant ears when the weather starts to get cold and the leaves start to get brown and crunchy. You can wait until after the first frost, but not much longer after that, or the tuber will die. 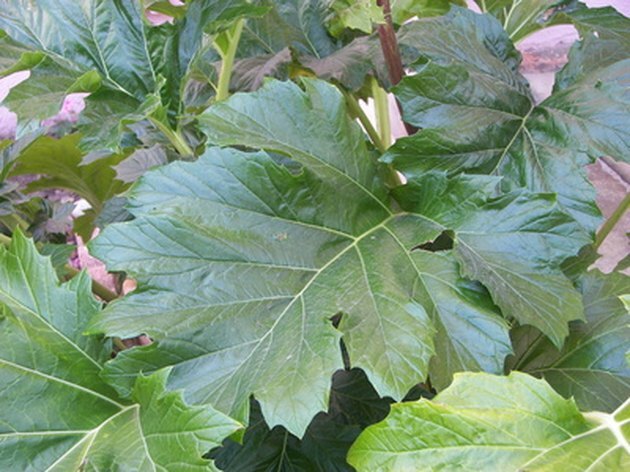 Remove the large leaves, leaving just a small stem 1 to 2 inches long. The best time to propagate, or split, the tuber, is when you plant your tender annuals outside, in the spring or early summer, depending on your climate. You can also divide them in the fall, after they have dried, for planting the next year. After digging up the plant, pull the roots apart into three sections, repotting or replanting them when you are done. You may see some wilting, but generally they spring back pretty well. For transplanting elephant ears, the best time to do so is in the spring or early summer. These plants do not have much of a root system, so they transplant fairly well. Use caution when digging up elephant ears. Any damage can can result in rot. Start by digging about 1 foot away from the base of the plant and gently lift the tuber from the soil to avoid damaging the plant. After you remove the tuber from the ground or pot, you will need to let it dry out before storing it. Gently rinse the dirt off, but do not scrub the tuber. Dry at 60 to 70 degrees F for two to three weeks. Dust with a fungicide after drying and before putting in storage. Store elephant ear tubers in a warm, dry area. Wrap them loosely in newspaper or place in a paper or mesh bag. Then put the bag in 2 to 3 inches of sawdust, peat moss or vermiculite. Check on tubers every few weeks during winter storage to monitor their condition. If they are shriveling, they are too dry. Spritz the packing medium with a water bottle to moisten it up a bit. Mold is an indication of too much moisture. Dip the tubers in a mild bleach solution and let them dry before returning them to storage. If you find pests, treat the tubers with an insecticide. Do not place tubers too close to one another. If one rots, distance will keep the others rot-free. Christine Jonard is a writer/editor who has been published in several textbooks. Since 2003, she has written feature articles for middle and high school biology textbooks, middle school earth sciences and general biology labs. She has copy-edited textbooks through final pages. She has a B.A. in English, a B.S. in zoology and a B.S. in psychology, all from the Ohio State University. 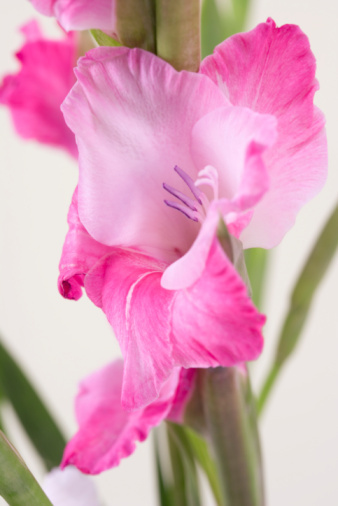 Do You Have to Dig Up Gladiolus in Fall?